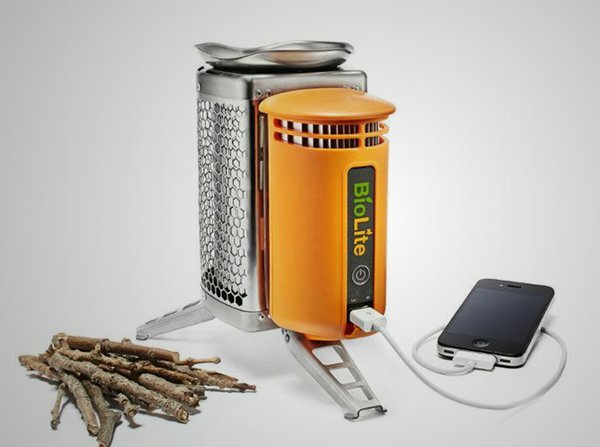 BioLite camp stove is a camping accessory designed to cook food using twigs and small pieces of wood that you can easily gather when in outdoors. It also comes with an USB charger that generates power from the flame and can be used to power your phones and other appliances. The stove uses a proprietary technology that converts heat into electricity which powers a built-in fan as well as supplies power via the USB cable. The fan is designed to keep the flame high and ensures that optimum heat s generated by burning the twigs. The BioLite camp stove not only suits camping needs but can also be used in case of a natural emergency or a power outage. It does away with other forms of camp cooking equipment that need other forms of fuels-thereby reducing the carbon footprint. The stove just weighs 935 grams and is compact with a height of 8.25 inches and width of 5 inches. It gives a peak power output of 5.5 KW while on high and 3.4 KW when set to a low flame. As an estimate, you would need about 46 grams of wood to boil a liter of water in just 4.5 minutes. The stove comes witha handy stuff stack, a gas lighter and a USB cord which can be used to power a lot of devices including smartphones. You just need to collect twigs, wood pellets etc- and use them as a fuel for your stove. The stove is made of stainless steel, aluminum and plastic and can support a container of 8 lbs or 1 gallon of a liquid. The Biolite camp stove is a very useful source of cooking in outdoors. It can also work as an on-demand electricity source, particularly at night in absence of regular power sources. It priced at $129 and can be purchased from their website at the below link.